Posted by ayaat in :: Holy Quran ::. In Surat al-Fath 27, Allah revealed to the Prophet (saas) that He would help and support him, that the dream was true, and that the believers would enter Makkah. A short while later, with the Treaty of Hudaybiyah and the conquest of Makkah, the believers entered the Sacred Mosque in complete safety, just as the dream had foretold. That was how Allah showed that it had been His will that the Prophet’s (saas) dream be fulfilled. The Prophet (saas) entered Makkah and conquered it in 8 ah (630). Two years later, all of the unbelievers left Makkah, just as Allah had said that they would. Another point that should be noted here is that when the Prophet (saas) gave that good news to the believers, it looked totally out of the question. In fact, the situation pointed in quite the opposite direction, and the polytheists appeared quite determined never to let the believers enter Makkah. As a result, those who had doubts in their hearts began to doubt the Prophet’s (saas) words. Yet, the Prophet (saas) trusted in Allah, paid no attention to the doubters’ words, and told people what Allah had revealed to him. The Qur’an confirmed his words, and the prediction was fulfilled shortly afterwards. No human on earth can draw a straight line on the surface of the earth between two far cities except with the aid of detailed maps, made possible today due to airplanes, satellites, and knowledge of latitude, longitude, and land height. However, there was a person who had done this 1400 years ago. This person is the prophet Muhammad (peace be upon him). While the prophet Muhammad (peace be upon him) was in Madinah Al-Munawarah, Allah instructed him that he should face in the direction of the Sacred Mosque in Makkah. From then on, it became the Qiblah for Muslims. And from then on, Islam was spreading. After the victory of (Fatih Makkah) people came and entered Islam. Then, the prophet (peace be upon him) started to sent the teachers to these people to teach them Islam. One of them Wabr ibn Yohanas Al-Khozaee whom the prophet (peace be upon him) sent to Yemen (Sana’a). He was ordered to teach people of Sana and to build them a Mosque by features the prophet (peace be upon him) had defined to him. 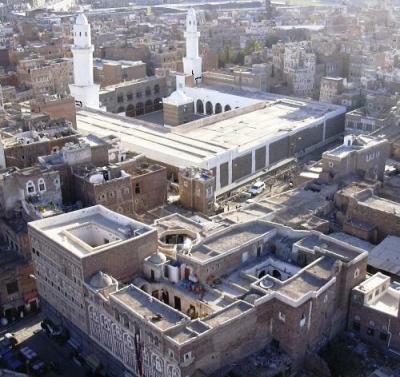 The prophet Muhammad (peace be upon him),1400 years age, ordered to build the mosque Sana’a facing Jabal-e-deen .If we use Google Earth and draw a straight line from the mosque Sana’a to the Qibla which is in Makkah, it will pass through the peak of jabal-e-deen and will end at the center of Kaba. How could someone 1400 years ago have shown the exact direction for kaba from a far away city without using the new aids needed for such a process?